Bible+ is a free Bible app for Windows 8 that allows you to read religious books right at your desktop, without browsing all over the Internet. A wider choice has been given to the users. Yupp…the app comes up with various different parts of Bible. This Windows 8 app lets you make comparison between the selected two Books. In addition, you can also read just the scriptures. Comes up with a great collection of religious books. Offers books in various languages. Lets you directly jump to any page with Verse Chooser. Offers dictionary to get the meaning of a word. 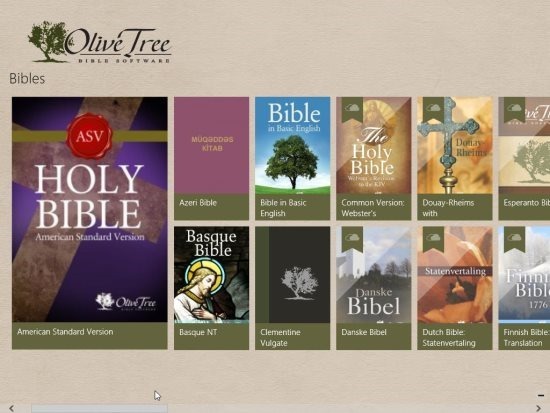 Windows 8 Bible+ App has been categorized into three parts – Bibles, Devotionals, and Dictionaries. However, you can read the first Bible book i.e Holy Bible. Now, in order to read more books you can download additional Bible books. However, make sure that you have Olive account. Yupp…you need to create one in case you do not have because only then you will be able to download other books. Apart from this, the Bible+ app for Windows 8 lets you translate text in a different language. Also, you can jump to any page without following a procedure with Verse Chooser option. Also, check out our post on Red Carpet App for Windows 8. Bible+ App is an excellent app to read about the religions matters which play a very important role in their life. Try this app available under the Books and Reference category within Windows 8 App Store.